How Amal Clooney, Jennifer Aniston, Cate Blanchett, Bill Murray, and more calmed their nerves and toasted their friend. Perched on a director’s chair in an off-the-shoulder pink Prada gown, as a man brushed her dark, flowing hair into a state of perfection, and a woman touched up her lipstick, Amal Clooney held up her phone to check her image in one hand, and clutched the notecards for anuncharacteristically personal speech in another. Amal, a woman accustomed to prosecuting war criminals at the Hague and speaking up for victims of ISIS at the United Nations, was about to talk to a ballroom full of celebrities about her husband,George Clooney. “I’m just going to remind you, because you’re tall, that you don’t have to lean into the microphone,” a stage manager told Amal, who nodded knowingly. Amal’s composure stood in contrast to the anxiety of the professional entertainers who came to fête George at the June 6 A.F.I. Life Achievement Award gala, which TNT will air on Thursday at 10 P.M., E.S.T, and TCM will rebroadcast in September during a night of programming dedicated to George’s work. Vanity Fair was allowed to linger in the wings of Hollywood’s Dolby Theatre during the show, a perfect perch for watching stars like Jennifer Aniston, Courteney Cox, Bill Murray, Diane Keaton, Miley Cyrus, Shirley MacLaine, Julianna Margulies, Jimmy Kimmel, Laura Dern, Anna Kendrick, andRichard Kind pay tribute to and occasionally roast their friend. “Why do we do this? We could just say no,” Kendrick said. “I was just crying in the bathroom,” Blanchett replied. Some presenters opted to switch up the stage crew’s well laid plans. “The ladies are swapping! The ladies are swapping!” a stage manager said into his headset, as Aniston and Cox decided to enter from the opposite sides of the stage to which they had been assigned (Aniston preferred to enter from stage left). A photographer asked Aniston if it was O.K. to snap a photo. “Do it without me knowing,” Aniston said. At age 57, George seemed to many to be too young to be collecting a life-achievement award. “I know all of you thought the same thing that I thought,” Murray told the crowd. “George is dying.” Instead, George seemed to be living his best life. At the end of the evening, after an emotional speech in which he praised the “one great love” in his life, the actor came backstage and thanked the catering crew. “Has that ever happened before?” one waiter asked another, who shook his head, wide-eyed. As well-wishers departed for an after-party, George huddled with Amal and his parents backstage, all of them beaming. “Oh my golly!” said George’s father, Nick. “You did a wonderful job,” his mother, Nina, said to Amal. Carolhathway - It's one of his stock go-to stories whenever he talks about growing up. Baseball, the Christmas gift-giving, the bunk bed penance... there are a few stories he goes back to time and again. Do you guys remember the interview that he did where he explained his baseball audition? I was thinking about it while watching the clip, but I can't remember if he was on a talk show or what. He also talked about it with Letterman on 'My next guest needs no introduction'. Thank you for the article, ladies. It's somehow comforting knowing that they stil suffer from stage fright. "At the end of the evening, after an emotional speech in which he praised the “one great love” in his life, the actor came backstage and thanked the catering crew. “Has that ever happened before?” one waiter asked another, who shook his head, wide-eyed." LizzyNY wrote: It looks like fun, but what does it have to do with George? Amal mention "Mary Poppins" in her speech. I wonder if George or Amal have a voice-over in it. Has the news of its release been extended to the overall public? Doug Ross, so true! I don’t think you could find a nicer celebrity in Hollywood than George. He IS the best! Did you ever watch his appearance on ‘Ellen’ with two of the Cincinnati Red’s Hall of Fame baseball players? It was a great interview! Yes, Donna, I saw that interview. It's probably one the first interview with that I've seen, back then. Well, we had the interview with Dave. But Lipton's interviews are always great. will someone record the telecast tomorrow? or do you think i could find it online later? party animal - not! wrote: It's not out. I was asking if the trailer has been released. Benex - I'm sorry I can't record it for you but maybe someone else can. I'm pretty sure it'll turn up on YouTube fairly soon so you'll probably be able to catch it there. For anyone interested, the James Lipton interview was still on YouTube last time I looked and so was the Charlie Rose program where they toured George's Studio City house. I really wish Charlie Rose hadn't turned out to be such a perv. He was a great interviewer. It's Me - I just checked and you're right. For some reason they've taken down the complete interview - and not just George's interview. Seems like they edited all or most of the ITAS shows. If you go to YouTube and type in the Actor's Studio or George Clooney, you will find short clips taken from the show but not the whole show as it aired. I wonder why they did that. It's annoying. The awards season house tour and several of his other interviews with Charlie Rose are still there if you look under "George Clooney" and scroll down. What a pity! I especially loved that interview with James Lipton, his stories and especially his interaction with the students. Quite ironic that we can't see his work - but Charlie Rose's stuff is still there! Is there a live stream of TNT to watch the AFI awards? PAN - It isn't YouTube's fault. It seems The Actors Studio has edited most of the ITAS interviews and posted only a few segments of each. They've been doing this for a while, but they still had some complete interviews posted. Now it seems they don't. Really annoying. The Charlie Rose interviews pop up when you type in George's name on YouTube. (So do the ITAS clips, but you have to look for them.) I'm glad the Charlie Rose stuff is still there. He may be a pig, but he was a really good interviewer and his conversations with George were always interesting. Understand, Lizzy. 'Twas just an observation, and given that Charile Rose has had to disappear from the screens and the CEO of Youtube is a woman, I was surprised he was still there! Yep Lizzy sadly Charlie Rose really screwed himself. Such a talented interviewer and so smart (except about his personal behavior). Hairyhound, I think as Lizzy mentioned in an earlier post that you will need to look on YouTube for the video of the award show. I’m not aware of any other way to view it other than on the TNT cable network. It looks like TNT is going to show two ‘Oceans’ movies prior to the 10:00 award telecast. I don't know where to post it, but I remember Lisa Snowdon giving him the same vote. Doug Ross wrote: I don't know where to post it, but I remember Lisa Snowdon giving him the same vote. Are you ok Doug Ross? Maybe you want to talk about it. I have a listening ear. Everything's great. I was on Twitter and, accidentally, found that video. Doug Ross wrote: Everything's great. I was on Twitter and, accidentally, found that video. If he wasn't married, I could marry him today!!! Your twitter find made me . I've heard sometimes Christmas comes in July. Just a note re: the ITAS interview. I googled "George Clooney Inside the Actors Studio" and there were links to Bravo TV that aired the show. They don't have the complete program, but they do have about 15 clips - much more than the Actors Studio site. There were a lot of other links that I didn't have time to check out, so the whole thing might just be there somewhere for anyone who's interested. Thanks PAN and It's Me for the clips. I watched last night. George looked great and everyone seemed happy, but something felt off. There didn't seem to be enough speakers, and the speeches seemed too short to fill an evening of tributes to a whole career. Bill Murray said they gave him 9 minutes, but I don't think we saw more than 2 or 3. I know they have to edit to make room for commercials, but now I wonder what else they cut. I don't think we'll ever see the whole thing. That said, I loved his speech - especially what he said about his parents. It's wonderful that they were able to be there for something so special to him and to hear him credit them for being his inspiration. Lovely. I don’t remember the Tony Randell comment in last night’s telecast so time restraints may have required some minor editing. I enjoyed the speeches last night from George’s friends and family. Richard Kind was really funny. Jimmy Kimmel too! Personally I didn’t think the retrospective of George’s body of work was presented in the most effective way. There were films that weren’t included in the ceremony. And I didn’t like how there were scenes from some classic movies juxtaposed with some scenes of George’s movies. A scene from ‘Casablanca’ with Humphrey Bogart shown against a scene from ‘The Good German’? I get it ... but don’t really appreciate it. So as much as I liked seeing George and his family and friends and hearing the wonderful words about our guy I just didn’t think the event was produced that well. I love Amal's reaction, when Julianne said that George's a good kisser. Also, Nick and Nina reaction at the end makes me think that they cut a lot from the speech. Donnamarie - I agree about the production, but I still can't help but feel like there was a lot that we didn't get to see. They were there for hours. What were they doing in between those brief comments by his friends? I bet that's where all the fun was. IMO the best part of the evening were the interview clips of George and his and Amal's speeches. I really wish we could see Nick's speech. Shameless selfies, executives gone wild and where was Julia? 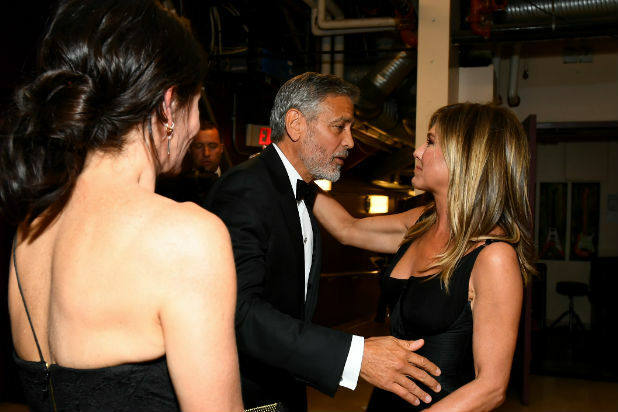 TNT aired the American Film Institute’s Lifetime Achievement Award special for George Clooney Thursday night — but the real shenanigans went down on June 11 at Hollywood’s Dolby Theatre. Presenters and the actor’s friends like Jennifer Aniston, Bill Murray, Don Cheadle, Cate Blanchett, Anna Kendrick, father Nick Clooney and Shirley MacLaine showed for the party. Many of Hollywood’s most powerful brass sit on the board of the American Film Institute, so naturally they’re invited to the big show. And come they did. Walt Disney Studios chairman Alan Horn attended, chatting up social types and journalists in the gallery bar of the Dolby before dinner. Tucked in a corner at the back of the house, furrow-browed and preoccupied, was Warner Bros. Entertainment CEO Kevin Tsujihara. In fairness, news that a federal court would approve the merger of WB owner Time Warner and tech giant AT&T was not yet decided or released. He was likely dodging uncomfortable questions from half the room (the show was taped on June 11). He wasn’t the most embattled executive there by a mile. Ironically, the most boisterous in the building was Leslie Moonves. Headlines were still raging about the CBS Corp. CEO’s contemptuous and extremely public battle with boss Shari Redstone. Nothing deterred him that night, with wife and anchor Julie Chen on his arm. The pair were from rolicking table to table, laughing and smiling with their peers. We also spotted Paramount CEO Jim Gianopulos, who had a lengthy conversation with the man of the hour. Other industry types in the room included Clooney’s longtime agents and CAA managing partners Bryan Lourd and Kevin Huvane. The former sat at Clooney’s table with husband Bruce Bozzi. The AFI tribute is perhaps the least private night of a given honoree’s life. Your career, loved ones, accolades and many individual characteristics and quirks are laid bare, but it’s a joyous kind of exposure. Still, it was a bit shocking to see how bold many of the invited dinner guests — some big stars in their own right — were in marching up to Clooney and his wife, Amal, to take selfies. Protocol dictates that after the guest of honor is introduced and heads to their table (a procession that is captured by TNT’s cameras) production takes a break and everyone is invited to eat dinner. With a forkful of breaded cod and cauliflower prepared by Wolfgang Puck in his mouth, guests marched up to Clooney and jutted their phones in front of his face. No “may I?” Not even a request that he stand. People wanted their Instagram name-drop and then to go about their business. Clooney was, of course, graceful and compliant. Amal even soldiered through one or two as the Audi-sponsored event raged on. In breaking with custom, the AFI offered a coffee-table-style retrospective of Clooney’s work as a token of the evening for dinner guests. Past years have doled out home entertainment box sets with honorees’ greatest hits. Another hit for the DVD market. Lets’s switch is up — here are a few things you’ll only see on TV, if at all. There were a few conspicuous stars missing in the flesh at the Dolby. Julia Roberts was originally announced as the A-lister who would physically hand the trophy to Clooney, which also comes with the added pressure of delivering the most succinct and poignant speech. Shirley MacLaine filled in and delivered an emotional and worthy speech though, even she had to admit onstage, she doesn’t know the guy that well. Also absent was Clooney’s “Oceans” partner in crime Brad Pitt, who appeared via pretaped message in a skit about Clooney’s legendary pranks. Matt Damon, another “Oceans” star who also led the Clooney-directed film “The Monuments Men,” was neither seen nor heard from. Don Cheadle held it town for the original cast of the Steven Soderbergh heist film family. Clooney is a part owner of Casamigos Tequila, which was suspiciously absent from the tables in the Dolby. That’s probably because it was on ice and perched on every free surface at the Clooneys’ after party. West Hollywood eatery and renowned celebrity haunt Craig’s played host to a precious few of the couple’s best friends. Their Casamigos partners and vacation pals Cindy Crawford and Rande Gerber were present. The fete’s unofficial emcee was Jimmy Kimmel, practically the first one to arrive who beamed at guests as they packed in. Tumblers of scotch were also passed. Marina sauce was spilled. Frank Sinatra was barely heard over conversations late into the night. I think it is wonderful the American Film Institute honored George Clooney with a Lifetime Achievement Award. I thought the mix between classic Hollywood in relationship with George Clooney's body of work was spot on. George Clooney is classic old Hollywood that translates to everyone from the 30's, 40's.... to 70's, 80's.... to Gen X, Millennials,... timeless talent. It was nice to see the American Film Institute honor his work. I loved the honor George extended to his parents. I loved his expression of the love and respect he has for the entertainment industry. I thought Amal's outfit was tacky and tasteless, I have no idea why any wife would wear that to honor her husband in front of his peers. Amal looked Sophisticated and elegant in that burgundy dress at the London Gala. She looked like a girlfriend trying way to hard at George Clooney's Award ceremony. Ladybug - Lighten up! She looked fine. After all, it is Hollywood. A little over-the-top fashion victim is ok. The color looked good on her and her hair looked nice. I'm sure George wasn't complaining. LizzyNY wrote: Ladybug - Lighten up! She looked fine. After all, it is Hollywood. A little over-the-top fashion victim is ok. The color looked good on her and her hair looked nice. I'm sure George wasn't complaining. In my opinion, Amal looked tacky and tasteless at George Clooney"s award dinner. In my opinion, Amal looked elegant and sophisticated days later at the London Gala. Both of these opinions were stated. And you are entitled to both opinions. Obviously they were stated, or I wouldn't have known about them. All I'm saying is that you're taking her clothes too seriously. IMO she looked ok. Better than some occasions, worse than others. Personally, I wouldn't have worn that get-up, but I wouldn't wear a lot of the stuff she does. Either way it doesn't matter because the night wasn't about her , it was all about George and he looked great. For this night, at least, she really was just arm candy. university alumni and a diplomatic event and Amal dressed accordingly. Oh god, now I get the prank with the nappy and the pot of nutella ahahah. That man in dangerous with children. Anyway, it's pretty strange that they reach for Brad Pitt but not Matt, maybe because he's out of town. I don't know the woman from the video, she's probably in Desperate Housewife of something. It doesn't matter what anyone thinks like all of us she wears what she likes. And George looked very happy and proud with her on his arm. She definitely is Pan.